Investors were unimpressed by the retailer's surprisingly soft holiday season results. Target (NYSE:TGT) shares dropped about 11% last month, according to data provided by S&P Global Market Intelligence. The slump contributed to a double-digit gap between the retailer and the broader market so far this year. Yet many of its peers, including Wal-Mart (NYSE:WMT), are underperforming the S&P 500 as well. 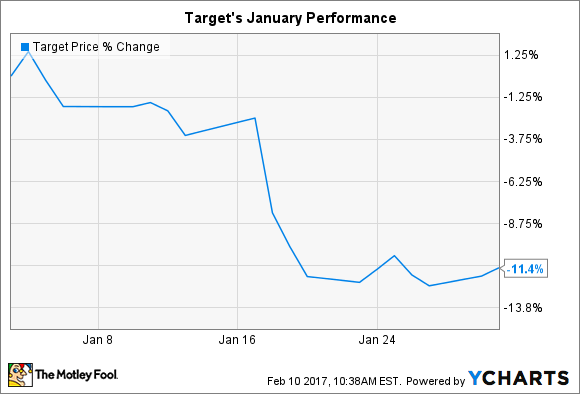 Target's January swoon came after the company announced surprisingly weak results for the key holiday shopping period. Comparable-store sales fell 3%, thanks to a nearly 2% drop in customer traffic. That slump was just partially offset by big gains in the online sales channel. The good news is that Target gained market share in e-commerce -- the bad news is it had to trade profitability. "The costs associated with the accelerated mix shift between our stores and digital channels and a highly promotional competitive environment had a negative impact on our fourth quarter margins and earnings per share," CEO Brian Cornell said in a press release. Wal-Mart hasn't announced its holiday figures yet, but the retailing titan has also warned investors to brace for lower profit growth ahead as it plows investments into competing online while protecting its traditional retailing locations. It enjoyed its seventh straight quarter of customer traffic growth last quarter, and investors will find out in late February if that streak extended into the holiday season. Fourth-quarter sales growth is expected to be slightly negative when Target announces its detailed earnings report on Feb. 28, down from the flat result Cornell and his team had originally projected. Lower profit margins, meanwhile, will ensure that earnings rise to just $5.05 per share for the full 2016 fiscal year. While that would mark a record high for the retailer, it's below the $5.20 per share that executives first forecast, so Wall Street needed to pull down their expectations. Over the longer term, Target's results will depend on management striking the right balance between pressing its core retailing advantages and making smart investments aimed at meeting customers' changing shopping preferences.